These days I call myself a runner...: I only went and won it! I only went and won it! I ran Challenge Running's inaugural Stort 30 race yesterday... a very pretty out and back 30 miler along the River Stort, with some lovely tree-covered sections, views across fields, lots of locks, and a bit of street running at the beginning and end. I told Lindley that I was going for a sub 4:45 (a 5 minute PB for me at 30 miles) and so he could forget about me placing anywhere near my race number! The night before the race, I'd been reading the twitter reports about that day's route recce that had been done by Allan Rumbles (who'd supported me at the Challenge Hub 50 miler in the summer) - he said it was slippery in the muddy sections from all the rain there'd been and someone was likely to end up in the river! ;) Unfortunately it then proceeded to rain pretty much all night, so by the time I got to the race I was ruing not having any trail shoes & convinced I'd be the one who'd be taking a swim! Nevertheless, my trusty Brooks road shoes were going to have to do as they are all I have! The thing I'm really enjoying about running these small ultras is the community aspect of it...and it's really nice that I'm starting to recognise and know people at the races. I hadn't met them before, as I know them through Twitter but I caught up with Conrad and Kate before we started who were both running their first ultras - so nice to put a face to the name and meet people in real life! I ended up running the first 5 miles with Conrad and it really does make such a difference running with someone - definitely makes it easier! Unfortunately we went out much faster than we'd planned. In my mind, I'd decided to keep my pace below 9:30min/miles, and Conrad had planned on 10min/miles but I think we did those first few at about 9min/miles which goes some way to explain why the wheels came off a bit for both of us during the latter part of the race! Anyway, despite forecasts to the contrary, the weather held for us all day, and it was cool and cloudy but with no rain. As expected though, it was ridiculously muddy in a few sections, and I lost my feet from under me many times where it had got very slippery...I am amazed that I didn't fall over or end up in the river. I had one ankle turn but only very minor and after hopping about for a few seconds, the pain disappeared quickly. A lot of the race was on hard path with a couple of sections on tarmac thankfully, so it wasn't all hard work! I definitely felt the effect of the mud though - I found my legs and back aching much more than I'd expected, and think it was because of all the sliding about and zigzagging! There were 5 checkpoints out on the course, and the marshals were all lovely - really enjoyed my brief chat with them, and the food and drink provision was excellent. The morale boosters from them all was even more appreciated...I passed the second checkpoint to be told I was second woman! Never happened before (the benefit of the Stort 30 being such a small race with so few female entrants) and unlikely to happen again, but I was very pleased. After that, at each checkpoint, I was reminded I was second woman. At mile 20, they told me I was still in second, but I should go after 1st place. I told them I was slowing down, and it was getting hard, and the girl in front just seemed to be disappearing from me, but they were very persuasive and confident, and told me to go for it. So I did. At some point, I managed to catch up to the girl in 1st, who stood to the side and wished me luck as I passed. How awesome is ultra running...no one would do that in a marathon!! She was running with (I'm assuming) her boyfriend - we had a chat after we'd finished, and it turns out he runs 100 milers and she's an Ironman, training for a double Ironman next year - incredible! This was her first ultra though so she did incredibly well. Anyway, after catching up, I carried on, but was getting slower and slower, seeing my time goal slip further and further away :( I kept walking when I should have been running, and stopping to stretch when I know I didn't need to. I'm not sure what was going on in my head, but it certainly wasn't my best performance in that respect. Unfortunately as I slowed, I got overtaken by lots of guys coming up through the field who had been able to maintain their pace, and I was definitely disappointed with my last 10 miles, but I finally made it to the finish line...1st LADY!!!! Yep, I won (the women's race) and it's the first time that's ever happened! I'm very pleased, and am really looking forward to seeing the photos from the race as I think there will be quite a few and without a doubt, this race is now going to have a special place in my heart, even though the time was way off what I'd hoped for - 4:57:38. I will be back next year and I'm determined to do much, much better - I doubt I'll be able to place again, but I'm will get a time I can be proud of! I stayed at the finish for an hour or so, having some of the lovely cake and supplies that were provided at what was essentially a final check point but with hot drinks too (why don't more races do this?!) chatting to people. I got presented with my prize for first lady (still totally unbelievable) and waited to see Kate finish which was brilliant, and then made my way home. I selected this post to be featured on Running Blogs. Please visit the site and vote for my blog! A great race report of what sounded like a great new race, but more importantly a huge congratulations on your first place. Very well done! "I'm determined to do much, much better" A true runner - won the race but still unhappy you didn't beat your time! First place - wahhhhhhhhhhh! What a bloomin' rockstar! Amazing achievement! Way to go!!!! That is brilliant Naomi, really well done! Congratulations! And thanks for hanging on at the end! I am thinking of stepping up to ultras in 2014 after outlaw 2013. Reports like this only fuel my ambitions. 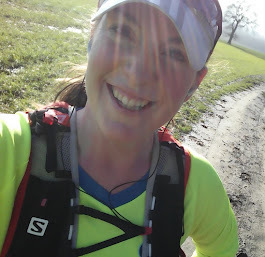 Would definitely recommend the Ultra route, I've absolutely loved them and discovered a whole new world of lovely people! Although the grass is always greener - after next year's ultras, I'm considering giving tri a go! So how did the Toad go? ?